Aspen Planers mill manager Surinder Momrath (right) with long time Aspen Planers employee Shalinder Wahid, who runs the mill’s LeTourneau equipment. Read all about how the LeTourneau equipment is helping Aspen Planers to efficiently manage their millyard, beginning on page 20. (Cover photo by Paul MacDonald). Following two tragic mill explosions/fires earlier this year, British Columbia’s major forest companies are creating a third party-certified dust audit that is expected to cover areas such as the equipment used to reduce dust levels in mills, and what can be done to generally create a safer work environment. First Nations-owned Nic Pac Logging started out with a few pieces of equipment, but has grown over the years, and now has the latest in processing heads, with two 7000XT LogMax processor heads mounted on Deere and Hitachi carriers. Faced with limits on the space they have for log storage—and a good appetite for timber from their sawmill—Aspen Planers of Merritt, B.C. has found LeTourneau log stacking equipment to be a good ally in managing their millyard efficiently. The Columbia Forest Products plywood plant in St. Casimir, Quebec, may be the company’s smallest, but it certainly is near the top of the pack when it comes to being resourceful and productive, with a number of changes and upgrades in recent years. Included in The Edge, Canada’s leading publication on research in the forest industry, are stories from FPInnovations, the Canadian Wood Fibre Centre, Alberta Innovates - Bio Solutions, Natural Resources Canada, Alberta’s Agriculture and Rural Development Department and Universite Laval. 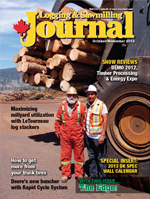 Logging and Sawmilling Journal reviews what was new at these two recent major industry shows at opposite ends of the continent, DEMO 2012 in Quebec and the Timber Processing & Energy Expo in Portland, Oregon. The new Rapid Cycle System (RCS) boom on John Deere bunchers is delivering a productivity boost, generally simplifying and speeding up the feller bunching process. An automated home building company in Alberta is helping to bring an end to on-site framing crews, and could open a new market for direct wood products sales for forest companies and sawmills. Straightforward maintenance checks in tire-related areas such as air pressure and proper alignments can boost the Return on Investment on your truck tires. The new Wood Innovation & Design Centre proposed for Prince George, B.C., could spur emerging wood use technologies, says Jim Stirling. For a feller buncher operator, fewer and easier to use controls can deliver a productivity boost, fuel savings and a more efficiently functioning machine, resulting in increased profitability. Not to mention a more satisfied operator. Those are among the advantages attributed to using John Deere feller bunchers fitted with a Rapid Cycle System (RCS) boom. The RCS improves machine productivity and operating speeds by automating both boom and cutting head motions, as well as by providing automated harvesting arm cycling to simplify the process for the machine operator. 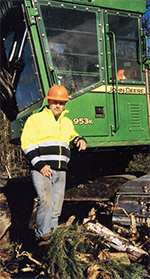 Donny Glover is one logging contractor using the combination who has no arguments with that assessment. “It’s got tons of saw power, the track power is awesome and the litres per cubic metre are way less,” he assesses after putting about 700 hours on his machine. Glover is a logging sub-contractor based in Prince George, British Columbia. “I wonder why some days,” he muses. The owner operator/small logging contractor has become something of an endangered species in the forests of north central B.C. The operating rules have shifted—again—to a trend of fewer and larger log contracting companies to harvest and deliver custom logs to regional sawmills. Glover’s company, D-Lin Investments Ltd., was working on a stand in the Anzac area northeast of Prince George. The prime contractor was Clusko Logging and the site was a B.C. Timber Sale where the beetle killed wood was designated 100 per cent pulp quality. 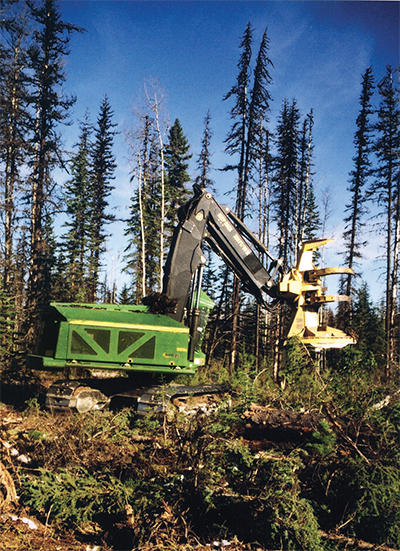 With Glover at the controls, the John Deere 953K buncher and RCS boom supplied by Deere dealer Brandt Tractor was making short work of the wood, accumulating and positioning multiple stems at a time. “This RCS is a whole other thing,” he concedes. “It takes about two weeks to fully catch on and make her cut wood.” And Glover’s no neophyte: he’s been working in the bush for about 25 years. When you get the hang of it, RCS is designed to simplify and quicken the feller bunching process. Essentially, RCS is a straight line system incorporating one joystick with buttons for accumulating and dumping wood. The boom reaches the wood faster with RCS. How much fuel the system saves is dependent on several factors including operator, wood types and operating conditions. Up to three litres an hour is an estimate. The RCS felling head auto-arm sequence is initiated when the operator presses a single button on the right-hand joystick in the feller buncher’s cab. A single motion of the joystick engages movement of the boom/stick/head, and the RCS automatically maintains the head’s cutting position throughout each boom reach. With the press of another joystick button, the head’s arms quickly release the bunch of trees. The automatic cutting head leveling, arm sequencing, and quick arm release are all exclusive to Deere and the RCS. The system improves the speed and productivity of the boom while it gives the operator fewer buttons and movements to think about, which helps reduce operator fatigue. RCS is available on John Deere 9 00K-Series tracked feller buncher models—903K, 909K, 953K and 959K. The 900K-series machines perform well and deliver power and productivity to jobs on any terrain and climate from Brazil to Canada to Siberia, and on flat, soft plantations to steep slopes and rocky terrain. In the case of Donny Glover’s buncher, further performance improvements were achieved when he requested modifications including shortening the accumulator arms on the FR24B rotary cutting head. They were small changes, but they gained significant production benefits as a result, notes Glover. He was running a second buncher on the show, a Tigercat 870. “I run a couple of machines at a time and like to be on site,” he says. The 953K was fitted with LED lighting for round the clock operation. “I like the visibility in the John Deere. You get a better view of what’s going on out the side,” he notes. Glover’s machine was purring along seemingly in low gear, given the operator and the small wood. But he casts a wide net when seeking work for his machines. “I’m trying to work the whole province with one machine,” he says. And that translates into a machine combo from Deere and Brandt Tractor that’s equally at home and efficient in southern B.C.—where occasional three foot diameter spruce or two foot fir may be encountered—to the valleys of small bug killed wood further north. And to date, the John Deere 953K with its RCS boom is meeting the challenge.